A complex intelligence augmentation system designed to achieve something very simple: better results for our clients. We believe our greatest strength is how we think. We’re constantly sharpening our skills, solving interesting problems and reaching higher. We started applying traditional risk and decision analysis to our case preparation, using decision-support software to deepen our insights and generate better results. It worked; risk and decision analysis processes and software made us better tax lawyers. But we wanted more. We wanted a system that would not only support but amplify how we think, enhancing our ability to develop specific tax appeal strategies grounded in client return on investment (“ROI”). We realized that the answer was a specialized software-driven solution called intelligence augmentation (“IA”). In our view, an IA system designed for tax appeals was the next vital step in gaining deeper analytical insights as we continue to expand our clients’ competitive advantage. So, we made a significant investment – about $150,000 in hard and soft costs – and we built it. Our proprietary software transforms our lawyers into tax appeal analysts with more cognitive processing power and the ability to consider a range of highly complex scenarios, each with its own unique and changing variables. The system is complex, but what it yields is very simple: better results for our clients. You can watch the our video to get a quick overview (above). If you’re interested in how CounterMeasure™ works – and why it leads to superior results – read on. Our initial article on risk and decision analysis in tax disputes compared it to traditional approaches, arguing that most tax lawyers rely on old-school analysis and a “gut methodology” that is unstructured and weak. We explained how applying risk and decision analysis to tax appeals has enhanced our practice, strengthened our competitive advantage, and generated superior returns for our clients. 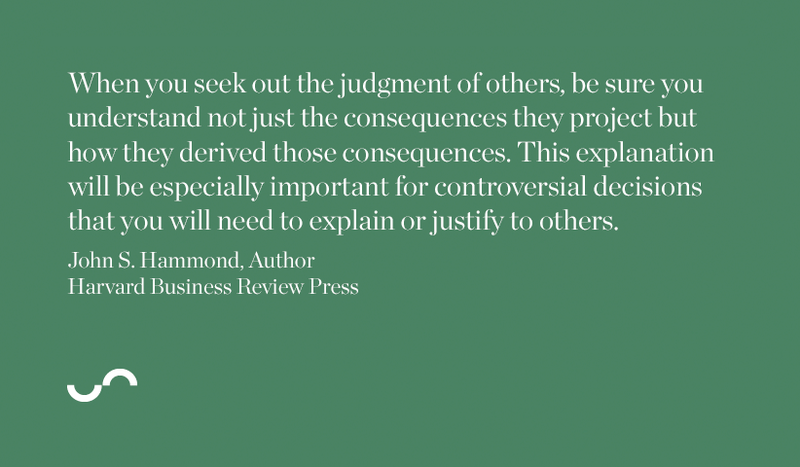 If you haven’t read Gaining a competitive advantage in tax appeals, it’s worth taking a look, as the context it provides will make the origin and concepts of CounterMeasure™ all the more clear. CounterMeasure™ is an IA system that interweaves together our firm’s Canadian tax appeal expertise with sophisticated data and issues exploration, mathematical and ROI computations, and enhanced prediction techniques – in a suite of sophisticated but intuitive automated processes. It was designed and built to combine the collective intelligence of several tax lawyers, leveraging the system’s computing power to amplify the level of insight we bring to every tax appeal. The programming is elaborate, but the fundamental premise is that tax lawyers working with machines are more powerful than tax lawyers working alone or without a specialized IA system. CounterMeasure™ gives our tax lawyers the ability to quickly dive into vast amounts of information to uncover alternative paths, weigh decisions and understand the implications of every possible decision. It gives us the ability to perform complex analysis and build realistic models that would be impractical – to say the least – using traditional methods. The system reveals opportunities and strategies that tax lawyers working without the benefit of augmented intelligence might overlook or never even consider. In addition, CounterMeasure™ enhances both transparency and accountability. It ensures that our clients and other stakeholders, at every stage in a tax appeal, understand the data, process steps and reasons underlying our recommendations and decisions. What’s more, CounterMeasure™ connects all of these elements to specific, measurable outcomes. And the system’s historical records provide everyone involved – our tax lawyers, clients and other stakeholders ­– with the ability to conduct constructive after-action reviews aimed at: (1) confirming the outcome is consistent with the target set at the outset of the appeal; (2) supporting any controversial decisions; and (3) identifying areas for improvement. CounterMeasure’s interface allows our tax lawyers to input custom facts, issues, and amounts in dispute related to each client’s tax appeal. The IA system identifies dependent relationships and automatically removes outcomes that contravene logic, legislation and established caselaw (e.g., statute-barred issues, gross-negligence penalty implications and so on). CounterMeasure™ calculates every permutation and possible result, then maps these potential outcomes to the tax dispute process and procedures outlined in the Income Tax Act, the Excise Tax Act and the Tax Court of Canada Rules (General Procedure). As well, the system aggregates potential principled settlements (as defined in Galway v. Minister of National Revenue) and highlights the best route to solving a particular client’s tax appeal. CounterMeasure™ isolates every tax appeal into its component issues. It allows our tax lawyers to identify, evaluate, combine and reassemble data and relationships to uncover information, devise strategies and project outcomes. It allows us to look at a tax appeal one way, then another, and still another – with all relevant data displayed graphically and in tables. With this level of clarity, everyone engaged in the tax appeal can immediately see meaningful correlations, potential constraints, and opportunities to conduct further in-depth analysis and strategizing. We believe that our clients’ ROI is the most important metric of success. CounterMeasure™ automatically calculates every permutation and possible result related to every issue (or combination of issues) within a case. The system also calculates the financial impact of every viable outcome (or combination of outcomes) at every stage, taking into account adjustments to federal and provincial tax rates, penalties, interest and legal fees. 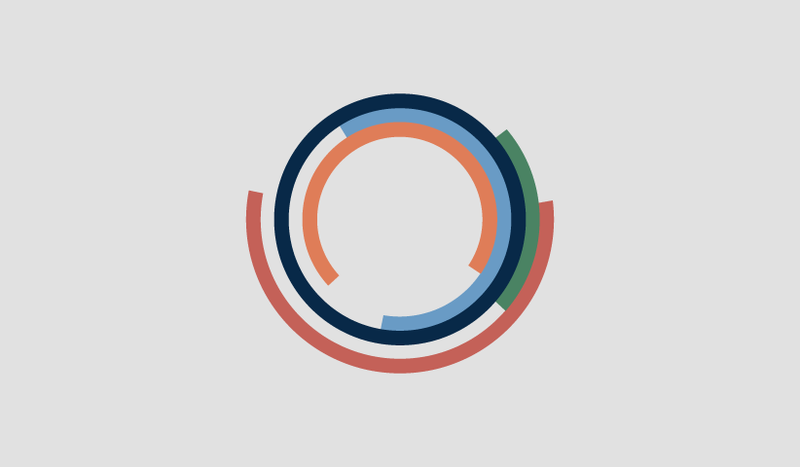 CounterMeasure’s comprehensive financial impact analysis – combined with highly targeted factual and legal investigation – helps stakeholders choose strategies that lead to the highest client ROI. CounterMeasure™ allows our tax lawyers to: (1) generate a variety of preconfigured models designed in accordance with the Tax Court of Canada’s process and procedures; (2) create and modify custom models; or (3) blend preconfigured models with custom elements to create unique and complex hybrid models quickly. As well, CounterMeasure™ identifies and removes improper results from visualizations and displays. It avoids the shortcomings that plague non-specialized software – for example, the omission of data, permutations and outcomes that artificially limit the scope of a model leading to inadequate analysis, overlooked consequences, and missed opportunities. CounterMeasure has integrated decision science and prediction techniques (and we continue to develop additional Good Judgment and Superforecasting features) to improve forecasting and decision-making systematically. The software allows our tax lawyers to translate real-world complexity and uncertainty into distinct elements and measurable outcomes – and just as importantly, to make updates as things change. Within the structure and visual environment created by CounterMeasure™, our tax lawyers can collaborate with clients and their accountants to leverage all parties’ cognitive diversity – and from there to pose and answer critical questions, identify missing elements, understand interdependent relationships, quantify risk and risk tolerance, and arrive at the best decisions. 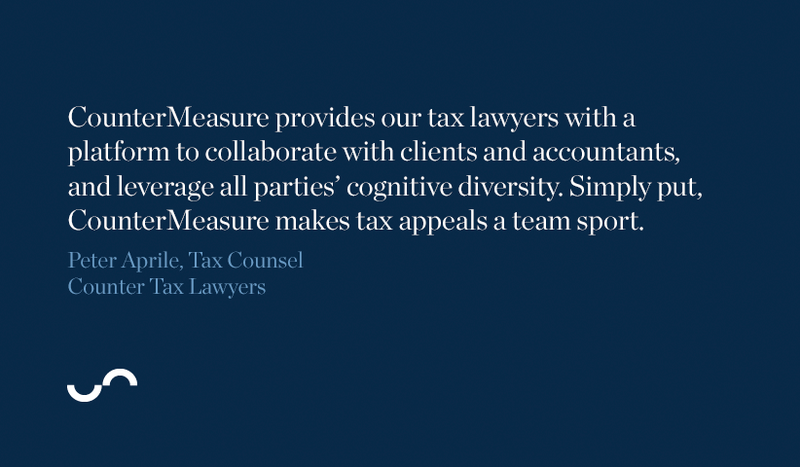 Simply put, CounterMeasure™ makes tax appeals a team sport. It’s clear that conventional analysis and solutions are no longer good enough – not when we can leverage IA systems to gain more cognitive power and deliver better results. CounterMeasure™ represents a significant step forward in tax appeal analysis and strategy. At the same time, it’s another concrete example of how our firm works: we’re constantly striving to think smarter and deeper, and we’re ready to invest in and build powerful tools to ensure the best possible results for our clients. 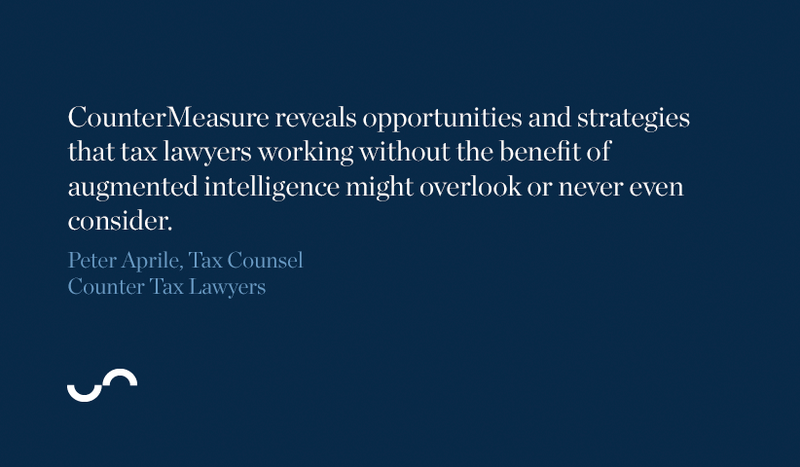 In further strengthening how we think and work, CounterMeasure™ is another big step forward in our transformation from tax lawyers to more powerful tax appeal analysts. And we’re not done by any means. Neota Logic’s blog and its Expert Systems in Legal Services article.